The mapping process which started in June 2011 from a blank spot to now a mapped has finally ended. 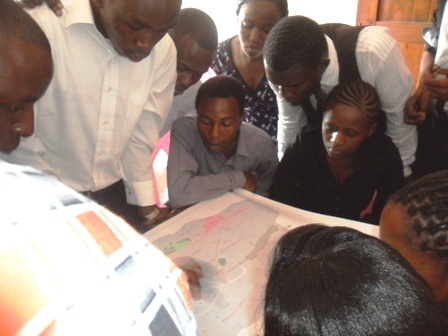 The final map is a product of close collaboration between the community in Tandale and Ardhi University students. The community leaders mostly sub chairmen from the six wards of Tandale through the stewardship Executive Ward Officer have been very supportive of the whole process. In the last two months a few important lessons for community mapping emerged that I feel is important for community development workers and mobilizers. The most important less was that government structures at the community level is critical when introducing community mapping. The blessing of officer at the ground makes it easier for the map to be distributed to relevant departments in engaged in developing a community. A place which is marginalized like Tandale needs the support of all stakeholder be it government, NGOs, CBOs or religious institution. Women / young girls engaged in the project exhibited more willingness and interest with the technology used, camer/video and GPS. At the end of the training, the best essay was about the project was from lady university student. She enumerated how we could use the training and equipment to address garbage problem in Tandale.